Years ago, as I rode the morning train into the city for university classes, I befriended another rider who shared the same stop. Often, we chatted about inconsequential things such as the weather and music – always scraping the surface, but never getting truly personal. She was a kind, witty woman; in her mid-twenties, she was already working downtown as a litigation assistant. Months passed and we took to sitting together whenever we spotted each other in line. Since I only had morning classes three times per week, I saw her on and off throughout the semester. Then, weeks went by and I didn’t see her at all. Reasoning that she had probably changed jobs (or careers – she often talked about branching out in her field), I thought about how lonely the ride seemed with no one to talk to. One morning, she once again appeared at my stop. I smiled broadly and approached quickly, taking long strides to meet up with her. As she turned, I instantly pulled back. She had lost weight; her eyes were rimmed with dark circles and her usually immaculately made up face was makeup-free and sallow. I hesitated; I knew something was terribly wrong, but I’ve never been particularly forward about soliciting bad news. So I smiled tentatively and told her it was good to see her again. Grinning back at me, we boarded the train and settled into our seats. “My mom is fighting cancer,” she announced with no preamble whatsoever. “There is always hope,” she replied with a smile. The train arrived at the station, we said goodbye and parted ways. And, I never saw her again. For weeks I scanned the obituaries for any mention of her family name. I looked for her every morning until the end of the school term, but she never reappeared at the train stop. There is always hope, she had said. In that moment, I prayed that her hope had given her strength. And that she knew I was thinking about her. This holiday season, I’m remembering my morning commuter with The Princess Margaret Cancer Foundation Doves of Hope Campaign. Doves of Hope show patients that they aren’t alone in their fight to conquer cancer. The Doves are completely free to create, and knowing that other people are fighting with them gives patients and their families tremendous hope during their journey with cancer…. And then you politely decline, or say “not this time”, and go about your purchase. I’ll be honest: I was that person. I was the person who politely shook her head while thrusting her card in the debit machine, all the while acting indifferent and busy. But then, after learning about The Home Depot’s Paper Hammer initiative, I decided what the heck, I’ll be someone else. I decided that buying a cart full of groceries meant that I could afford to feed my family. I reasoned that shopping at a toy store proved that I could spoil my children with gifts. And, I was certain that purchasing an armful of DIY home products meant that I had a roof over my head. So, for the first time ever, I purchased a Paper Hammer. For $2, less than 5% of my total bill, I can help others. And, I’d like to encourage you to do the same. With the launch of its 6th annual Buy a Hammer, Build Our Community campaign, The Home Depot is encouraging customers to purchase a ‘Paper Hammer’ for only $2 at checkout. The campaign runs from May 31st until July 4th, and is just one way The Home Depot Canada Foundation delivers on its commitment of supporting affordable housing and building strong communities for Canadians in need. – Currently, The Home Depot Canada Foundation donates more than $4-million in funding and product and thousands of volunteer hours each year to help build affordable, sustainable housing across Canada. – Each year, associates from The Home Depot volunteer over 60,000 hours of hands-on service on community projects across Canada through Team Depot, the company’s associate volunteer program. – Throughout 2012, The Home Depot Canada Foundation will support more than 15 Habitat for Humanity projects from coast to coast. C’mon folks – you don’t have to be the person who politely declines. I’ve got one Paper Hammer purchase under my belt; looking forward to putting my name on paper for many more charitable initiatives. For more information, please visit www.homedepot.ca/foundation. This post is sponsored by The Home Depot. The opinions on this blog are my own. A few weeks ago, I shared The Story of Ryder, and let you all know that I had joined MiracleMoms – a group of influential, passionate, and motivated women eager to tell the stories of families who use, or have used the services of the Children’s Miracle Network or Children’s Miracle Hospitals. Then, I introduced you to Madison – the sweet, special little girl treated at Sick Kids. Today, I am once again asking you to help me raise $500.00 for the MiracleMoms Program for The Hospital for Sick Children. I am asking my readers to help me, to join my team, to help me raise $500.00 by following the link to my personal #MiracleMoms Donation Page and making a donation now. All contributions will benefit Sick Kids Foundation through Children’s Miracle Network Hospitals. Donations of $20 or more will receive tax receipt. Thank you so much to everyone who donates, shares this page, or helps spread the word about Children’s Miracle Network. You are all totally awesome. I am part of the MiracleMoms program and receive compensation for my participation in this program. All thoughts and opinions reflected in this post are my own. And THAT’s Where Your Donation Goes. I know you know this: I’ve joined #MiracleMoms to help raise funds for the Hospital for Sick Children. I’m often asked where fundraising dollars go. To tell the truth, I don’t have the entire answer. But I can share this video with you – hopefully, it will clear up any questions… and touch your heart. Today, I am asking my readers to help me, to join my team, to help me raise $500.00 by following the link to my personal #MiracleMoms Donation Page and making a donation now. Thank you so much to everyone who donates, shares this page, or helps spread the word about Children’s Miracle Network. I used to believe that miracles were the work of a divine authority; that prayer, sacrifice and perseverance would somehow set in motion an event contrary to the laws of nature. And while I still believe in divine intervention, I also believe that miracles can be manufactured by people just like you and me. I believe in that certain individuals – namely, the doctors at The Hospital For Sick Children – have the skill, knowledge and passion to give hope, ignite faith, and change lives. A few weeks ago, I shared The Story of Ryder, and let you all know that I had joined MiracleMoms – a group of influential, passionate, and motivated women eager to tell the stories of families who use, or have used the services of the Children’s Miracle Network or Children’s Miracle Hospitals. Since our local Children’s Miracle Hospital happens to be SickKids, I thought the program would be a splendid fit. Today, I want to introduce you to Madison – the sweet, special little girl picture right. In May 2005, Madison was on a walk with her kindergarten class when she passed out and was taken to hospital. She returned home for the weekend, but was brought to her paediatrician for tests and x-rays the following Monday and Tuesday. The x-ray revealed that Madison’s heart was enlarged so she was transferred to The Hospital for Sick Children. There her family received the devastating news that Madison was battling a terminal disease called pulmonary hypertension. In this condition, there is increased pressure in the pulmonary artery which connects the right side of the heart to the lungs. The increased pressure makes the right side of the heart get bigger because it’s working harder to pump the blood which can lead to heart failure. Doctors estimated her lifespan would be three to five years with the possibility of a future heart or lung transplant…. On a cold, rainy day such as today, I dream of comfort food. Homemade lasagna, fiery Tex-Mex chili, spaghetti bolognese and of course, spicy butter chicken. Besides being the absolutely cure for all things gloomy, the above dishes have two things in common: they all freeze exceptionally well, and they’re all made using Hunt’s Tomato Sauce. Seriously, who doesn’t love Hunt’s? Their products are a staple in my pantry; I’ve found that diced, crushed and/or stewed tomatoes can enhance just about any meal – lending sweetness, texture and flavour. And, stocking my freezer with homemade, savoury meals allows me to cut down on expensive takeout; provide my husband with a nutritious, low-sodium lunch; and keep portions controlled for the different members (and appetites) in our family. It’s Week #3 of the Hunt’s Tomato Cook-off; this week, Gav’s Cabbage Rolls are up against Kath’s Easy Butter Chicken. You decide which one of the two chefs has done the best job featuring Hunt’s products…. LOVE when companies give back. This season, look your best – and help girls around the world reach their full potential – with products from Marcelle’s limited edition Because I Am A Girl branded products. It all started with Plan Canada’s initiative to harness the incredible power that girls and women have here at home and in the developing world. Because I am a Girl is Plan’s global campaign to break the cycle of poverty and gender discrimination. Girls have the right to be educated. Girls have the right to eat. Girls have the right to be safe. Girls’ rights are human rights. Ambassador for Because I Am A Girl, two-time Olympic medalist Jennifer Heil, has a goal to raise one million dollars for the initiative, and Marcelle is lending their support. For a limited time, when you buy any of Marcelle’s three best-selling products, $0.50 will be donated to Because I am a Girl. The three products are available at the majority of retailers across Canada that sell Marcelle products, and are easily recognizable in their special pink packaging. Ideal to drop in your suitcase, purse or gym bag! In one easy step, cleanse and remove face and eye make-up without leaving a greasy after-feel. They eliminate long wearing make-up, including waterproof mascara, while preserving the skin’s natural moisture balance. Thoroughly cleansed, the skin feels comfortable and regains its softness. Pre-moistened with a mild lotion, they respect the eye’s delicate pH balance, so it is safe for sensitive eyes and contact lens wearers. I’ve been using Marcelle’s cleansing cloths for over a year now – usually on nights when I’m too tired to remain standing, let alone go through a whole cleansing/ toning/ moisturizing routine with up to six different products. After a quick wipe with the cleansing cloths, my skin is clean, refreshed and smooth – never dry. And I simply LOVE the special pink packaging! A two-in-one blush and highlighter, with five perfectly coordinated shimmer tones, which illuminates and defines cheeks for a pretty pink glow. It’s hypo-allergenic, perfume free and provides long-lasting colour. If you’re looking for a pink blush that exudes “sweet and innocent”, this is the one for you, ladies! The perfect petal pink with a healthy dose of shimmery highlights. Simply gorgeous. Jennifer Heil’s favourite gloss colour! A light gel-based liquid formula that is non-sticky and won’t run, and provides long-lasting hydration, long-lasting colour, exceptional comfort and light coverage. Enriched with emollients and a revitalizing cocktail of ingredients, it’s perfect for achieving a plumping effect for seductive lips. It’s hypo-allergenic and perfume free. To view some of the hottest trends in beauty and makeup, visit Marcelle Cosmetics. Today, have a Big Mac, Coffee/Tea or Happy Meal, and McDonalds will donate $1 to local children’s charities. More than 1400 McDonald’s restaurants across Canada will celebrate McHappy Day… why not lend your support to this truly worthy cause? I’m taking the kiddos out in the wagon this afternoon and plan on making a pit stop to McD’s for a Happy Meal. They’ll be surprised (and ecstatic) to say the least! Happy McHappy Day! Exciting News from The Body Shop! This post has been a long time coming… especially since the great deals, fabulous products and exciting news keep piling up! 1. Have you checked out The Body Shop Canada’s NEW website? With increased functionality (you can finally see sale prices as you place them in your cart vs. waiting for the invoice), ability to accept coupon codes (more savings!) and a quicker, faster shopping experience, you’ll love shopping from the comfort of your home. Now I am a little disappointed to see that shipping rates have increased from a flat $5 to $7.95, but if you don’t live near a Body Shop and are currently pumping $1.38/litre (that’s what we filled up at yesterday – insane!) then it just may be worth your while to load up your online cart. You can also call a friend and combine your purchases to save on shipping. Be sure to scroll to the bottom of the main page and sign up for TBS’ mailing list; you’ll be first to know about promos, new products and worthwhile campaigns. 2. Until 11:59pm tonight, take advantage of their Mother’s Day sale. Simply add a gift container to your cart for $5, and then proceed to save 30% off your entire purchase! Plus, 50% of the proceeds from the gift basket purchase will be donated to the Somaly Mam Foundation. 3. Did you purchase last week’s Groupon for The Body Shop? If so, be sure to redeem it before May 30th to grab a cool $45 worth of goodies. After May 30th, the value decreases slightly to $40. Last time around, I was able to combine my Groupon with a similar 30% off promotion (Erin Mills Town Centre), but readers wrote in saying that they had varying degrees of success from store to store. Call ahead to see if you’re able to grab insane savings by using your Groupon today. Help mom create a pampering paradise at home, with The Body Shop Spa Wisdom collection, which is inspired by beauty rituals, traditions and ingredients from around the world. The collection features Spa Wisdom Morocco, Africa, Japan and Polynesia. These blissful collections combine authentic indigenous and Community Trade ingredients while featuring captivating fragrances and sensorial textures. Help your mom discover The Body Shop Spa Wisdom scrubs, body cleansers and moisturizers. Indulge your mom with the luxurious Coconut Bath & Body range that’s enriched with pure, organic, cold-pressed, virgin coconut oil, sourced from Samoa through the Community Trade programme. Skin is softened, conditioned and delightfully fragranced with the tropical scent of coconut that’s reminiscent of long, lingering summer days. It’s like applying pure happiness to your skin. 5. Shower the Earth Lovers Way – Make a positive splash on the environment by showering with the NEW Eco-conscious 100% biodegradable Earth Lovers shower gel range. There are six refreshing fragrances: Lemon & Thyme, Mint & Cucumber, Watermelon & Eucalyptus, Apricot & Basil, Fig & Rosemary and Pear & Lemongrass. I had the pleasure of trying the Apricot & Basil, Mint & Cucumber and Lemon & Thyme scents. The Apricot & Basil is very sweet smelling, and will be a runaway winner for those who are keen on peachy-like fragrances. Mint & Cucumber was my least favourite; I thought it was too “foody” and it felt like I was preparing a salad in the shower a la Kramer from Seinfeld. But, I can’t deny it’s refreshing after-smell and cool, tingly sensation. And I absolutely LOVED the Lemon & Thyme – a very masculine scent, the unique combination gives off a sensual fragrance which lingers hours after your shower. It’s currently my husband’s go-to shower gel! 6. If you buy just one eye palette this spring, consider TBS’ Limited Collection for Eyes. 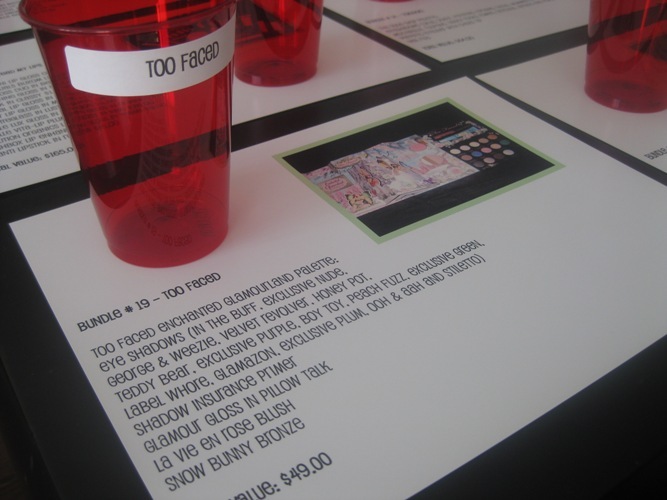 The packaging was designed by the London College of Fashion – tres cool my friends. I received the A La Mode (02) palette and love the night looks I’ve been able to pull together with the cool combination of shimmer and smoke. The palette normally retails for $24, but you can grab it for a sweet $16.80 with your 30% discount. This one won’t be around for long, so collectors, take note! 7. 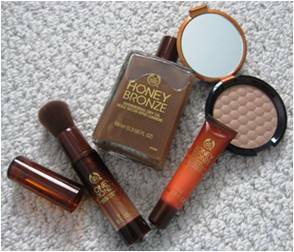 Finally, I am in the process of reviewing The body Shop’s NEW Honey Bronze lineup. Just in time for summer, I can fake a sun-kissed glow (without the damage) thanks to their Shimmering Dry Oil, Brilliance Bronzer, Bronzing Powder and Lip Nectar. My initial feedback is that the Bronzing Powder is the perfect matte colour for a touch of sun without the shine. Try sweeping it along the bridge of your nose, across your forehead and of course, on your cheeks for a natural, lightly tanned look. Further reviews to follow… perhaps in time for my Summer Beauty Bash? Stay tuned! That’s a lot of exciting news from The Body Shop! The malls are now open… so if you’re sitting at home, reading this post… get off your duff and visit your nearest store today! Click here to shop at The Body Shop Canada. Nobody can deny that shoes are an integral part of any outfit. Accordingly to Cosmopolitan, the average woman owns 17 pairs of shoes. But not everyone is so lucky. In many developing countries, children must walk barefoot for miles to school, clean water and medical help, and hundreds of millions of children are at risk of injury, infection and soil-transmitted diseases that most can’t afford to prevent and treat. 1. Purchase your new kicks from TOMS Shoes. In 2006, American traveler Blake Mycoskie befriended children in a village in Argentina and found they had no shoes to protect their feet. Wanting to help, he created TOMS Shoes, a company that matches every pair of shoes purchased with a pair of new shoes given to a child in need with their One for One™ campaign. To date, TOMS has given over one million pairs of new shoes to children through giving partners around the world. 2. Go SHOELESS tomorrow. On April 5th, you are encouraged to go without shoes to raise awareness of the positive impact a pair of shoes can have on a child’s life. Last year, more than 250,000 people went without shoes! You may even know some of the Canadians supporting this year’s campaign: Danny Fernades, Aliya-Jasmine Sovani of MTV Canada and Jacynthe. This is the fourth year that the march has taken place. What a wonderful initiative. And do check out TOMS shoes – the casual, comfortable styles are affordable… and the Wedges are fabulous! Back from Safari, the Kenya Stripe Wedge. Attention-grabbing bold lines over coarse hemp makes any spot along your journey a destination. Native design meets city style, the Kenya Stripe Wedge. TOMS classic suede insole with rubber cushion for comfort; Soft suede heel insert for added comfort; Durable solid rubber outsole with “One for One” script design. Love them! I especially like that the TOMS brand is synonymous with giving, so that little blue logo tells everyone I’m fashionable – and charitable! To find out more, go to www.OneDayWithoutShoes.com to get all the latest updates, create and join events in your area, download an event tool kit, etc. You can also stay connected through mobile apps on iPhone and Android – see website for more details. Consider ditching your shoes tomorrow for this incredibly worthy cause. And in case you were wondering, TOMS just doesn’t donate any old pair of shoes: the shoes are made to order and constantly evolving. They are only created in the sizes that the children need, and adapt the shoes to best fit the children’s lives – whether it’s thicker soles, water-resistant materials or school uniform colours. A few weeks ago, reader Alice forwarded an e-mail with a link for International Women’s Day (March 8th). Well, as many of y’all know, my inbox is regularly a disaster… and I just opened the message this evening. Visit Kim’s site, I Believe She’s Amazing, to join the journey and recognize amazing women and help unite 1,000,000 women globally. Simply submit the name/e-mail address of a gal who inspires you, and a note will be sent to that special woman recognizing her. The site is also accepting donations for Look Good Feel Better, a non-profit organization that helps women undergoing cancer treatment to feel radiant and beautiful, even through a difficult time in their lives. This is to honour Erika, who was the national spokeswoman for the program. Last Sunday, I spent a “beauty-full” afternoon with some pretty special ladies. 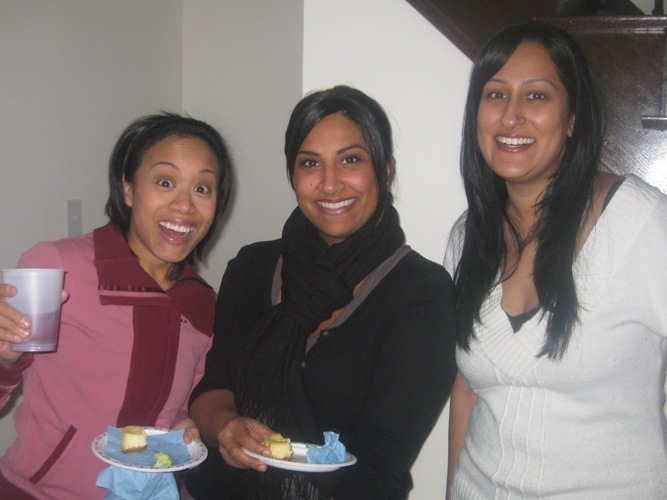 It was the ultimate girly fest – we had fun makeovers thanks to Mala Brar (check out my gorgeous eye makeup here), swapped beauty secrets and nibbled on yummy goodies (including sinful mini cheesecakes and delectable coffee cake courtesy of Shauna at Kindergarten Confidential. YUM). Oh, and we happened to raise over $500 for a pretty awesome charity. Perhaps I should rewind. Now it’s no secret that I receive many products to review. We’re always testing a thing or two (or three, or four) chez Lena! But the reality is, sometimes I end up with more products that I have space for, and de-cluttering is in order. Such is the case with my 2010 Holiday Beauty Fest; while I loved reviewing all the makeup and beauty items, I simply had to find good homes for all the fabulous face candy. What’s a girl to do? Hold a Charity Raffle, of course! So I created bundles of products that I had on hand. I invited a few friends to purchase raffle tickets for a chance to win the bundle of makeup, with 100% of the proceeds going to charity. It seemed like such a good idea that more girls wanted in. So I contacted a few amazing sponsors – e.l.f., CARGO and Vasanti Cosmetics – and they generously sent even more makeup my way to raffle off. In the end, I had 24 bundles (each with a total retail value of $50 or more – most were actually closer to the $120 mark), and 15 ladies eager to get their hands on the pretty loot! The ladies each put in a minimum of $20.00, which offered them 20 raffle tickets. They were given the chance to allocate the tickets however they wished – Lotus topped off her three favourite bundles (and proceeded to win them all! You go girl!) while Runner Mama spread the luck around (and walked away with my favourite palette). Lots of ladies donated much more than the minimum amount, which allowed me to turn an afternoon of girlicious fun into raising a ton of money for a great cause. I can’t wait to do it all over again! Q: I would have liked to attend. Why didn’t you publicize it? A: It started off pretty small (just a few friends), and in the end, I had to limit the amount of ladies to space in my living room. Plus, since it was held at my home (with my children present), I wanted to make sure that I personally knew all those attending. Q: Which charity did you donate the proceeds to? A: Since I am regularly solicited by many charitable foundations, I prefer not to publicly align with one or another. Therefore, I will tell you this: all of the ladies who attended were made aware of the charity beforehand, and it is a well-known children’s organization. A: I’m working on it! I’m hoping to hold another charity raffle in the fall – if I’m able to grab some notable sponsorships, I may be able to hold it in a neutral location and open it up to local readers as well. I’ll keep you posted! then simply pictures of the lots (plus a cup to place tickets) were presented instead. It worked really well. 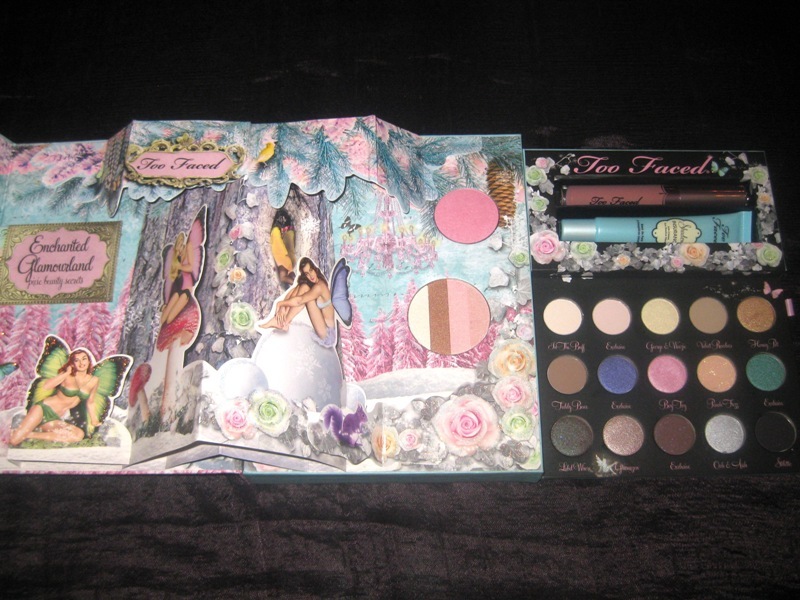 The Too Faced Bundle – before the cup was crammed with tickets. Three gorgeous guests waiting for their turn to participate. And here she is again, with mermaid-inspired eyes. You looked hot, girl! Special thanks again to e.l.f. Cosmetics, CARGO Cosmetics and Vasanti Cosmetics. They all donated a generous amount of their best selling products to make several of the bundles some of the most envied prizes to be won. Although it was hard to part with all that makeup, I put it in perspective for a few of the ladies at the event – if I was giving away all that I didn’t need, imagine how much I kept for myself! I’m still proud to declare that I’m a hoarder extraordinaire! Snack Pack: Share a Smile! How can a SMILE help feed the needy? It’s simple! Snack Pack, creators of the delicious puddings and juicy gels (I’m addicted to the Ice Cream Sandwich dessert pudding), has teamed up with Food Banks Canada for their Share a Smile campaign. Each and every day adults and children alike go hungry – and with the holidays around the corner, let’s make sure that everyone can look forward to Christmas dinner. Food Banks Canada would like to raise $20,000 in time for the holidays – and you can help! Here’s how it works. “Like” Snack Pack Canada’s Facebook page, click the Smile tab, and a $1 donation will be made on your behalf to Food Banks Canada. You can also opt to Share a Smile and Snack Pack will make the donation on behalf of one of your Facebook friends. Remember, the more often you smile, the more donations, ballots and points you’ll collect. Imagine, if you – and all your friends – took just 10 seconds to smile every day, Food Banks Canada would reach their goal in no time. To entice you further, there are tons of weekly prizes to be won – just register for the contest and cross your fingers! I am participating in the Snack Pack program by Mom Central on behalf of Conagra Foods Canada. I received a gift card as a thank you for my participation. The opinions on this blog are my own. It’s no secret that I LOVE MD Moms baby care products. In fact, two of their items are in my “Lena-Approved Hall of Fame”- Baby Silk Soothing Bottom Relief (my miracle cream) and Baby Silk Gentle Scalp Rub (THE cradle crap solution). The entire line gets my full endorsement and then some. “Fans of MD Moms award-winning Babysafe Sunscreen Towelettes can now find the same lightweight SPF 30+ sunscreen in a fragrance- and paraben-free lotion. The Daily UV Shield 30+ Moisturizing Lotion is a dual-purpose lotion designed for daily use that keeps skin nourished and soothed while providing complete protection from UV rays. Yes! Yes! Yes! I’ve been waiting for MD Moms to introduce a sun protection lotion – as much as I love the sunscreen towelettes, sometimes it’s nice to reapply just where you need it most. And I’ve just about had it with rashes, redness and irritation from other “kid-friendly” sunscreens – MD Moms Babysafe products are the ONLY ones that Ryder does not react to. The lotion will be available in January 2011 – can’t wait! Just in time for the holidays, I’m also loving MD Moms’ Silky Smooth Baby Gift Set. This collection of essentials from MD Moms Baby Silk line (the first pediatrician-developed personal care line for babies) keeps baby silky smooth from nose to toes. The gift set includes Daily Skin Protection Moisturizing Balm, Soothing Bottom Relief Diaper Rash Cream and Delicate Skin Comfort Silky Liquid Powder. All items come in a reusable keepsake box. I’ll tell you this – if I was a new mom, or a mom-to-be, I would be VERY happy with this gift set. It contains three of their most popular items, all designed to provide maximum antioxidant protection, relieve dryness, soothe sensitive or irritated skin, promote healing and protect the skin’s natural moisture barrier. BLISS for baby, indeed. Finally, yet another reason to love the Moms? They give back! “Dedicated to improving the health and well being of children, MD Moms will designate a portion of its sales for 2011 to the Epilepsy Foundation of Greater Los Angeles (EFGLA) Care & Cure for Children. MD Moms selects a children’s charity to work with each year. The Care & Cure Initiatives work to improve access to specialty care in pediatric epilepsy and to pursue research for childhood epilepsy cures. In the U.S., epilepsy is the third most common neurological disorder after Alzheimer’s disease and stroke, affecting about 3 million people. Of those, more than 300,000 are children under the age of 15. Click here to visit MD Moms.